We can put the tenterhooks away for a bit and celebrate! 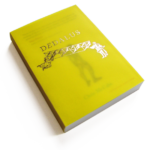 We are delighted to hear that Dedalus by Chris McCabe has been longlisted for the trailblazing Republic of Consciousness Prize for Small Presses. The prize that has brought so many great books and publishers together over the last three years. The first port of call for anyone jaded by the scope of mainstream publishing. 90% of the books I have read in the last three years I found on this list. Counternarratives, the Absalon series by Simon Okotie, Forbidden Line, We That Are Young and Lucia from Galley Beggar, Darker With The Lights On (which led to a reading rabbit hole with Little Island Press). It feels like being offered a seat at the top table of Independent Publishing. Thank you to the Judges! And fill your boots with the longlist here on the TLS blog.